These lightly stained wood Bellows are not only the perfect way to keep those home fires burning-these bellows make a beautiful fireplace accessory! Bellows add blown in air to help you start a fire or rekindle a dying fire by adding bursts of oxygen just where you need it. These bellows measure 15 in. long and come with a handy loop attached to the top of the handle to hang it near your fireplace. These bellows will be an attractive addition to your hearth with its light oak stain and simulated leather collapsible side and top areas. This bellows is a real help when starting a fire in our charcoal grill. Its size makes it easy to manipulate and use, and it definitely helps the fire to heat faster. After we ordered it, we were surprised at how quickly it came. It was in pristine condition after being shipped, and worked marvelously. We are actually kind of sad the season is almost over. This is a nice quality product with secure metal parts and sturdy wood. It seems to be quite durable. It is rather small though, so it does not hold a large amount of air. It is most effective when used to produce quick, short bursts of air. The bellows really looks good just about anywhere, and it is fully functional. I am extremely pleased with the quality of their products, so this company will have my business again. My experience buying the bellows has been pleasant, and my time using the bellows has been pleasant. With a price like this, what more is there to say? I see too many bellows that turn out to be just for show, so it is refreshing to find one that not only looks good but also works well. Although I wish the nozzle wasn't as short as it is, this bellows can really move some air. After using it for a little while, I can't really say that I've had any real issues with it not working. The Bellow looks great and works like a charm !! Sure has helped getting the fire going again when it was almost out. This thing really puts out tons of air (which is surprising seeing as it seems a little tiny). You really get a good deal for this price, and fires are much easier. I know some people who have trouble keeping a fire going, but this bellows makes it absolutely foolproof to keep a fire lit. I looked around at different prices when shopping for a bellows, and I can honestly say this is a great deal. Even with specifications, we didn't realize just how small this bellows would be. It is significantly smaller than our previous bellows, and we can really tell the difference. It does work, but it requires a lot more pumping to get the same results. Based on the price, I assumed that this item would be cheaply made or defective. In reality, it is a nice, medium-sized bellows with a good amount of power. It puts enough air to easily get a fire burning well. I recommend this product without hesitation. This product is a good size to store with the rest of my fireplace tools, but it still produces an effective amount of air. The size also makes it easy to use. Based on my observations, I think that it is built from pine rather than hardwood. 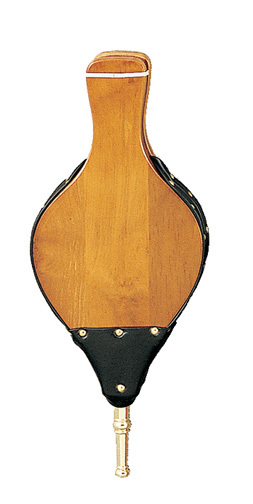 My previous bellows was almost exactly the same as this one, and it last for about four years. Even with light use, the vinyl began to crack and melt, which resulted in lots of air leaks. That length of use does seem fairly reasonable for the price though. I bought this bellows as a gift, and it seems to have worked out well. The person to whom I gave it did remark on its small size but also said that it functions well in his wood stove. I do like the craftsmanship that has been put into this bellows. Don't expect to use this to get a roaring bonfire going or anything, but it is extremely useful if you want to get a nice fire going without any accelerants. I tend to go back to blowing on a fire once it is going, but you might be able to use this to get it going really well if you pumped hard. No risk of getting dizzy when you use this.